Hi there! 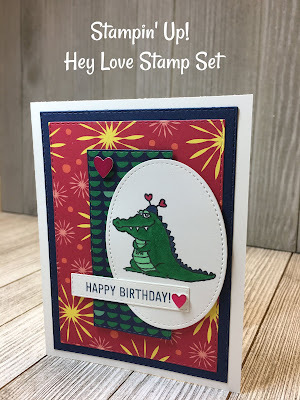 I am back with another project using my favorite Hey Love Stamp Set. I made a cute birthday card this time. I paired it with the Happiness Blooms Designer Series Paper in the Occasions Catalog. This paper pack offers bold and bright florals on the front, and all-purpose patterns on the back. It makes very versatile for any occasion and I love the bright colors! I played around with different sizes of the Rectangle Stitched Framelits for the layers. 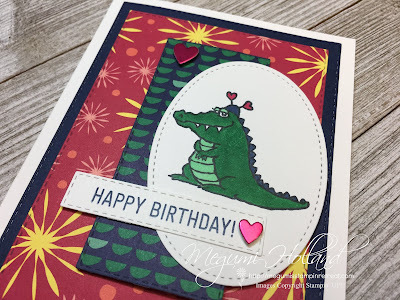 The Rectangle Stitched Framelits are absolutely my ultimate favorite framelits that Stampin' Up! has ever introduced!!! By the way, did you know the Rectangle Stitched Framelits Set is available as a bundle with the Amazing Life Stamp Set? I happen to like this stamps set and was glad to take the 10% off together! Thank you Stampin' Up!! !